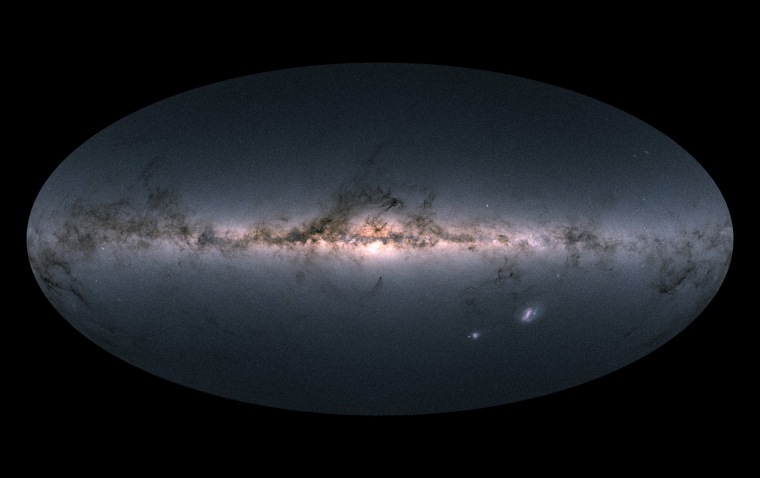 Spectacular 3-D atlas shows 1.7 billion stars in unprecedented detail. The European Space Agency has now mapped the Milky Way in unprecedented detail, releasing a stunning three-dimensional atlas of more than 1.7 billion stars in our home galaxy. The new star map, created by ESA’s sun-orbiting Gaia space observatory and released to the public on April 25, was hailed by astronomers around the world as a data gold mine — one that will bring, via a process known as galactic archaeology, a better understanding of how our galaxy and others like it formed and evolved. “I think it’s fair to say that the data from this release is going to revolutionize our understanding of the Milky Way galaxy,” Dr. Anthony Gonzalez, a University of Florida astronomer who is not involved with the Gaia mission, told NBC News MACH in an email. As Gaia orbits the sun, the spacecraft slowly spins to allow its two telescopes to scan the sky and study some 100,000 stars each minute. The 3-D atlas, based on data collected by Gaia over a 22-month period, shows the sizes of the stars as well as how they are moving and how far away they are from us. In addition to all those stars, the map shows the positions of more than 14,000 asteroids and 500,000 quasars, which are ultra-bright celestial objects fueled by supermassive black holes. The $1 billion Gaia spacecraft was launched into space in 2013 on a five-year mission to create the largest and most accurate 3-D map of the Milky Way. ESA says the observatory could also find new asteroids and exoplanets, and even be used to test Einstein’s theory of relativity.